Kids must brush their teeth two times - once in the morning and then in the night. 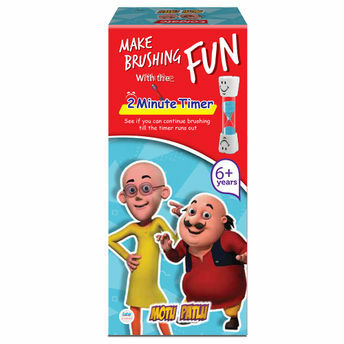 Colgate Kids Motu Patlu Toothpaste is a fun way to ensure they enjoy good oral care habits early on! This delicious toothpaste is especially designed for children from age 2 to 5 years who have front baby teeth and developing molars. This toothpaste now comes with free toys, making brushing fun with amusing cartoon characters by their side. The toothpaste provides clinically proven cavity and enamel protection. It is mild and safe for your child, and effectively cleanses their mouth, leaving it fresh. It has a fruity flavour, something your child will enjoy brushing with. Recommended by Indian Society of Pedodontics and Preventive Dentistry, Colgate offers a healthy and thorough clean. It ensures your kid’s smile gets brighter and cleaner with every use. About the Brand: Trusted by Millions across the world, Colgate-Palmolive is a global household and consumer care brand producing safe and effective personal care products. From oral care to personal care, from home care to pet nutrition, Colgate-Palmolive makes the products that make you smile. Colgate is No.1 toothbrush and toothpaste brand , offering quality oral care products, including toothpastes and toothbrushes, as well as expert dental health information. Explore the entire range of Teeth & Dental Care available on Nykaa. Shop more Colgate products here.You can browse through the complete world of Colgate Teeth & Dental Care .